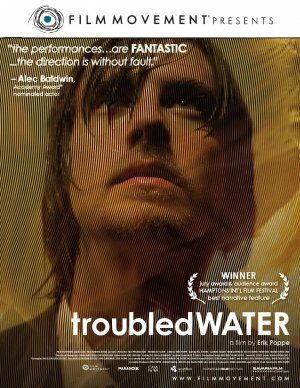 Troubled Water is a 2008 film by the Norwegian director, Erik Poppe, from a screenplay by Harald Rosenløw Eeg. A teenager, Jan Thomas (Pål Sverre Valheim Hagen), and another boy steal a stroller, resulting in the death of a four-year-old boy. Jan is sent to prison, where he learns to play the organ and performs in religious services. At the recommendation of the prison pastor, Jan, who is now an adult, is paroled and he applies for, and gets, a job as an organist at a Lutheran church. He eventually becomes romantically involved with the church’s priest, Anna (Ellen Dorrit Petersen), while becoming a father figure towards her young son, Jens, who bears a resemblance to Isak. By chance, Isak’s mother, Agnes (Trine Dyrholm) learns that Jan is working at the church. Still haunted by her son’s death, she begins following Jan and learns of his relationship with Jens. She convinces herself that Jan is going to harm Jens, so she ends up abducting the latter, creating a crisis not only for Jan and Anna, but also for Agnes’s own family. The first half is shown from Jan’s point-of-view, and the second half is shown from Agnes’s point-of-view. There are two main issues in this film. The first is Jan’s unwillingness to admit his responsibility for a terrible crime. The second is Agnes’s unwillingness to forgive Jan or to even see him as a human being. These issues feed off each other during the course of the movie, resulting in its terrifying climax. Troubled Water is a highly intelligent drama that argues for the necessity of moral responsibility, understanding, and forgiveness. The film benefits from good performances from the cast. Dyrholm is especially powerful as Agnes. She makes the character’s growing anxiety and paranoia convincing. I wish this film had wider distribution here in the US, for it touches upon issues that are relevant to the debate over the death penalty. This entry was posted on February 19, 2012 at 8:10 am and is filed under Capital Punishment, Cinema, Crime, Norway. You can follow any responses to this entry through the RSS 2.0 feed. You can leave a response, or trackback from your own site.